This work was commissioned by the Hanover Girls’ Choir in 2014, a year marking not only the centenary of the Great War (1914-1918) but also the 300th anniversary of the Hanoverian Succession to the throne of England upon the death of Queen Anne in 1714. While the latter circumstance prompted a desire for a work reflecting upon friendship and unity, faint but abiding resonances of the former suggested that the theme might be viewed in more universal terms, especially since the music was commissioned with a view to collaborative harmony between distinguished German and English performers. 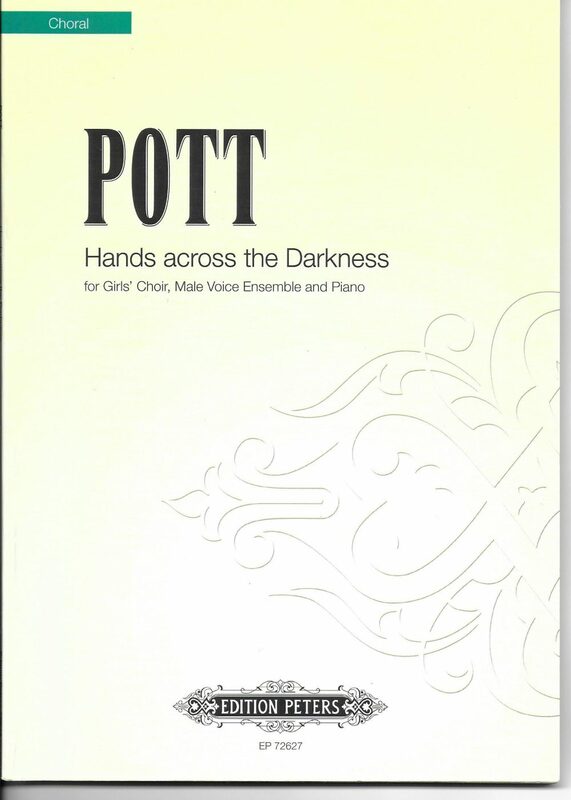 It was with this in mind that Charles Bennett provided his libretto, which, going yet further afield, listens to the still, small voice of peace and humanity as it insistently reaches us from the oppressed of any time and place. A piece written for the combined forces of the Hanover Girls’ Choir and the King’s Singers presents an arguably unique challenge in terms of reconciling and balancing widely contrasted forces: a group of six male soloists, of whom only three occupy the bass range, and a far larger complement of massed upper voices. Taking my cue from Charles Bennett’s strophic arrangement of verse and chorus, I decided to confine the King’s Singers initially to the chorus sections, and to provide them with self-contained material – in effect, almost a separate piece altogether – which would be heard initially as a quiet backdrop to the girls but gradually acquire greater prominence: no small challenge, given the need for both linear independence and overall harmonic unity. At the same time, I needed to respond to the text’s gradual transition from the personal and intimate to the universal and all-encompassing (reflected in imagery which moves cumulatively from microcosms of nature to the elemental power of the ocean). Therefore the first two verses deploy only two upper parts, while the third divides the sopranos to create three parts. Meanwhile, the chorus provided by the King’s Singers expands from an initial three lower voices to four parts, then six. In the final verse, roles are initially reversed: it is the King’s Singers who present the verse, with a brief interpolation from the upper parts, before a chorus in which finally all voices come together. Until this point, the material given to the King’s Singers has made use of the final part of the ‘Agnus Dei’ from the text of the Latin Mass: ‘Agnus Dei qui tollis peccata mundi, dona nobis pacem’. This has been set in strictly imitative polyphonic counterpoint which continued as a backdrop to the chorus. Now the Latin polyphony is abandoned and all voices join in a polyphonic tapestry of sound which confines itself to the modern, English text. Gradually this subsides (through the phrase ‘let us turn the darkness into music’) to leave only the girls’ chorus, whose music expires in unresolved mid-cadence, leaving the King’s Singers to continue in the first unaccompanied music of the piece. This is a homophonic setting of the Agnus Dei text (that is, one in which the parts now move verbally and rhythmically as one). It was actually written before the rest of the music, the reason being that it provided the melodic contours of the respective imitative ‘points’ or motifs on which all the foregoing Latin contributions to the chorus were to be based. These are therefore heard now ‘end to end’ in one continuous span, broken only by a pair of brief echoes of the earlier English chorus sections (based on the very opening notes of the piece, where they are heard on the piano). Finally, ‘dona nobis pacem’ awakens a direct response from the upper voices, in the form of the final words from Charles Bennett’s text: ‘Now is the time for all to be at peace’. The King’s Singers then echo the word ‘peace’ and the piano has the last word of all, ending very much as it began. This music as a whole seeks to fashion an unlikely marriage of accompanied music for the girls’ choir, its syncopations at times loosely suggestive of a more popular idiom, to liturgical polyphony with roots detectably in the music of many centuries ago. In general, the piano part is identified with the girls’ chorus rather than the ensemble of adult soloists, and its dynamic contrasts reflect this, although it also provides essential weight in the bass regions of what would otherwise be an unworkably top-heavy texture. Above all, I have attempted to create singable and melodious lines for all, allied to an approachable harmonic idiom capable of accommodating many disparate elements.